You might be wondering, "are they redesigning again?!" Whenever I&apos;m asked that, my answer is always a resounding "OF COURSE!" Sure the Scotch site is currently good enough, but there&apos;s always ways to improve. This next version is what v7 was supposed to become. In this post, I&apos;ll dive into some of the main technical changes and reasons why. Launch is impending (tm) (copyright). Before we can design something new, we need to know where we come from. We have to identify problems and iterate on them (or blow them up). Otherwise, we&apos;d end up with the same problems as the previous design. History repeats itself as they say. In the states, Scotch responds quickly. We&apos;re hosted over at Digital Ocean in New York. Our site audience is pretty global though. And those speeds are not as impressive. Load time doubles when moving across the world to Mumbai. Unacceptable! Also, first byte time for both of those are slower than Google&apos;s recommended 200ms. Solid numbers! Really excited about that first interactive improvement. Still early numbers and I still think we can improve. We&apos;ll talk about how we got to these numbers later in this post. Ever since v7 launched, our pages/visit went down from ~3 to 1.3. Big loss there and we think this will fix it. We&apos;ll have a lot more updates on finding new content when we get closer to launch. The JAM stack is a great way to build blogs these days. Blogs these days are becoming more and more static. Many blogs (including Smashing Magazine) have moved towards static-sites. If we built a blog starting today, with the tools available, what would it look like? I knew that we had go fully static. The question is how to do that? Do we move our entire infrastructure? Can we use what we currently have and create a static site? Two parts. Do we move the API? Do we move our frontend markup? We decided that having a static site brought lots of benefits that we needed. This can&apos;t be underestimated at how much speed this brings, especially globally. If you never have to spin up a server, you can serve pure HTML for a request and speed things up greatly. No wonder so many are doing it. We&apos;ve seen this with traditional server-side setups by using Varnish and NGINX Caching. I tried that with the Scotch setup, but never found configuration easy enough. I don&apos;t consider myself a backend devops type person (hats off to those who can), so I wanted an easier setup. The big problem with going to a fully static site is removing any server-side session usage. Our entire auth setup! This leads us to the next point. Moving to a JWT setup means we got to separate backend API and frontend concerns. Move our blog to a 3rd party. Medium, Ghost, WordPress, etc. Not for us. This is the traditional JAM stack setup. We invested a lot of time into our setup and have some custom stuff. It would probably take a decent amount of time to move the API to Contentful or prismic. Also, that&apos;s another expense we&apos;d have to take on monthly. 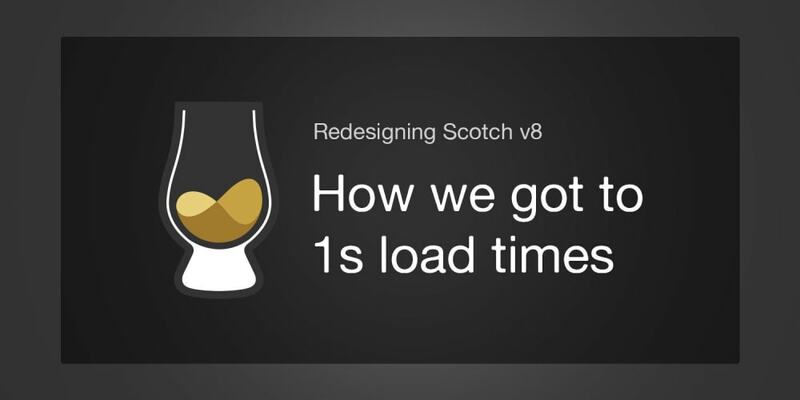 We&apos;re still a small team (Scotch is a side project for us) and want to stay as lean as possible. As few monthly expenses as possible so this option would&apos;ve brought on two new costs (Contentful and Netlify). This was something we really looked at. Ultimately, we wanted to see if there was something easier than moving the entire frontend. With all these awesome new tools out there, what would be the best solution that got us a better site and got it fast? The problem we faced is that we already have a solid backend built fully custom on Laravel with lots of custom features. We decided to keep our current Laravel backend and API. We also decided that we&apos;d use Laravel to serve our HTML but also add React on top for the auth things. So how would we get a static site? Drumroll... we would let our good friends at Cloudflare handle that! Sometimes the best solution is the easiest. I know this solution came out of left field. It&apos;s essentially change as little as possible. I like to call what we&apos;ve done "JAM Stack-ish". Cloudflare is amazing (not paid to say this). We even have a case study. With Cloudflare handling the static site generation and us using our already existing API, we were able to switch to static pretty easily. The architecture change of switching from session auth to JWT auth was the biggest amount of work. Since we had to redo all the auth, might as well redesign the site and fix our problems! How we improved content discovery? This was a long journey learning about the current state of blogs and are happy with the choices we&apos;ve made. This isn&apos;t to say that these choices will be right for your setup, but definitely weigh all the options. It may be tempting to move to the latest and greatest, but ask if that&apos;s really the best way forward. Let me know what you think of our changes moving forward!